Kim Min Hee (김민희) attended the premiere of 'The Suspect (용의자)' held at COEX Megabox in Seoul, South Korea on December 17, 2013. 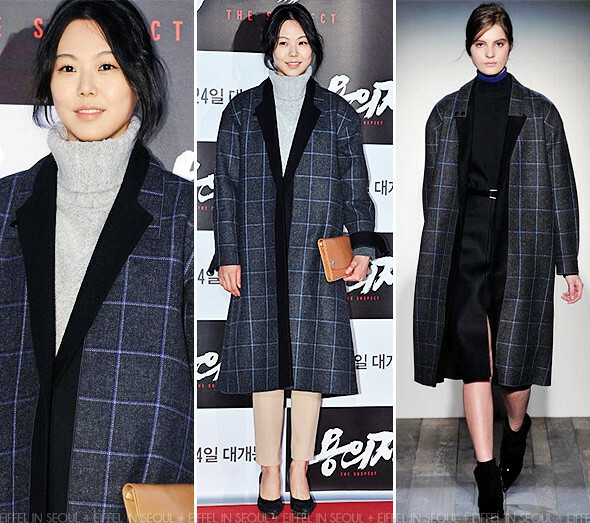 The Korean actress opted for a checkered wool coat from Victoria Beckham Fall/Winter 2013 collection. A grey turtleneck Johnny Hates Jazz sweater, a beige Chloé pants, platform pumps and a brown Acne clutch completed her look. The coat certainly added some edge to her otherwise seemingly, boring outfit.